You will want to adjust the speaker stands to that the tweeters of the A2+’s are just above ear level when you are seated. This will provide the best frequency response balance because the tweeters dispersion characteristics. 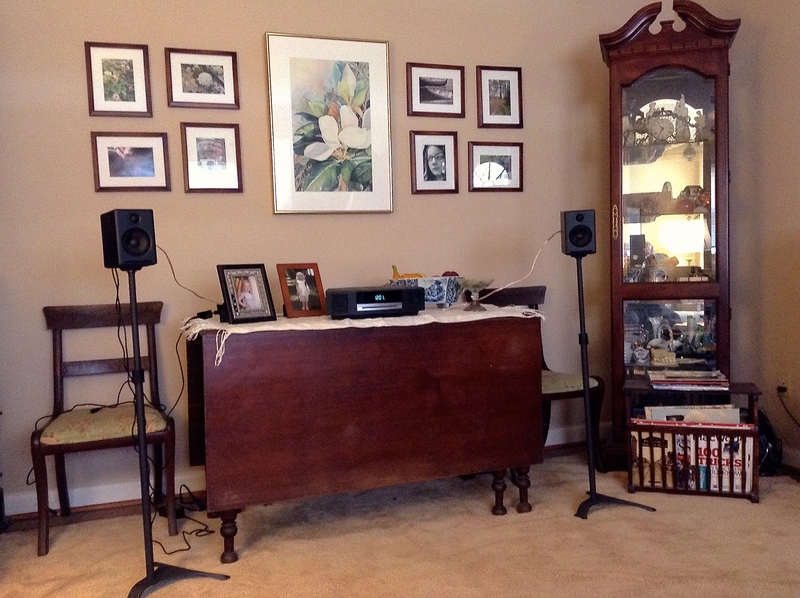 In addition, the speaker stands should be angled inwardly. Why is this? We must understand that the tweeter dispersion of monitor speakers are limited, that is to say they are controlled. After all, they were designed to monitor the recording space and not the listening space. The less interaction with room acoustics the better. However, the downside to this design is that the sweet spot for listening to the best balanced sound has been narrowed. One may easily counteract this narrowing by firing the tweeters inside the listeners ears. The tweeters should not be aimed at the listeners ears but aimed slightly inside them. When this is done the sweet spot is greatly extended. How so? Well when one moves off-center and closer to one of the speakers, the high frequency sound from that speaker is decreased while the highs from the outer speaker is increased. This will work for any monitor style of speaker. When the speakers are moved away from walls and elevated above any horizontal surface the bass response will be diminished. This response is actually phony bass which muddies the sound. The A2+’s were designed to be flat away from such boundaries believe it or not. However, many listeners will miss the added bass. The best answer is to add quality bass only where it is needed. This means a good subwoofer is a small monitors best friend. It not only extends the bass but also lowers any potential distortion of the midrange speakers. The subwoofer produces the low bass which frees the midrange drivers from longer cone excursions. The result will a cleaner midrange frequency response. Furthermore, dynamic-range and power handing will be greatly increased. One may play the A2+’s louder without undue distortion. The object is not really to play them louder, but play them cleaner and more dynamic. To be honest, the A2+’s are not room shaking rock speakers and never will be. But they will play the dynamics of Jazz and orchestral music with ease in a modest room, especially with the addition of a subwoofer. We will want to explore setting a subwoofer with the A2+’s. The ideal is to not know that the subwoofer is in the system at all. We will hear it only when it is needed. It will extend the lower range of the system but it will not interfere with the midrange sound or the stereo imaging in any way. But this is a project for another day. Good listening. My bedroom is 10×10, would you say these speakers are adequate enough to fill them with nice sound? I enjoy electronic and hip hop music, so I will be purchasing a PSW10 subwoofer (as you recommended in another post). They would be more than adequate. You may have a problem with your room being a square. The placement of the subwoofer would be important. Experiment. Dial in a roll off below 100 hz and watch the volume of the subwoofer. If set too loud the overall sound may be boomy. State-of-the-art sound in the bedroom! My My. So how is the A2+ for EDM and Hip Hop music? Is it good? Thank you for this guide. I had trouble finding desktop stands for these speakers until I came across these custom order stands on ebay. They took well over a month to deliver but the fit and finish is excellent. Elevating the speakers and adding the Pioneer SW-8MK2 Andrew Jones subwoofer (bought used on amazon for under $100) bring out the full potential of the A2+. I had also experimented by putting my JBL LSR305 on my desktop and it was just too much power to have that close to my face. I imagine that the A5+ speakers would also be overpowering for such near field listening. Glad you are enjoying your desktop system. If you ever want to use the speakers as a room audio system I believe you could pull it off with the Andrew Jones subwoofer. What speaker stands are these? Atlantic Satellite 77305018 2 Speaker Stands (Black) by Atlantic. Amazon carries these. They are quite nice, but not so good if you have a thick carpet. Hi, can you share how you mounted the A2+ to these stands? I know there’s a thread on the bottom of the A2+. Do these stands have a base w/ screw to mount to? Yes, they do. The combination of speaker and stand works very well together, makes a very neat installation.